I am sure you all know what a chocolate chip cookie is. I am almost certain that most of you tried to make some of these cookies at least, one time in your life. The only reason I posted this recipe is because my husband and kids never have enough of these cookies, so I thought, that this is a good opportunity to share my recipe with all of you. Try it. I am sure you will love them. For those who are on a diet I have to be honest... Making this recipe is not a good idea :-)!!! 1) Preheat the oven to 175ºC (350ºF). 3) Add the salt, vanilla and eggs; beat until well mixed. 4) Whisk together the flour, baking soda and baking powder and add to the butter mixture; mix until just combined. 5) Stir in the chocolate chips. 6) With the help of a spoon, form balls of dough. Place the dough balls on a baking sheet lined with parchment paper about 5-6cm apart. 7) Bake for about 10-11 minutes, or until they become golden around the edges. 8) Allow 2-3 minutes to cool and then transfer, with the help of a spatula, on a wire rack. Let to cool completely. 9) Store them in an airtight container . Do not freeze. I will definitely try these. They look delicious. I'm always looking for the perfect chocolate chip cookie. You just can't go wrong with Chocolate Chip cookies. There is just something so satisfying about eating these! 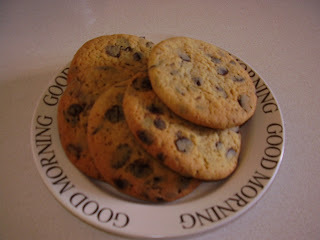 always love to see other choc chip recipes and your cookies look good , in my house too the cookies are gone the min it comes out of the oven . Your cookies sound delicious and I always use kerrygold as well. Next time you make them instead of using table salt, you should try them with coarse sea salt (1/2 to 3/4 tsp). This makes a huge difference to the taste. found you blog in foodbuzz and i can say that i'm enjoying your recipes and your photos.Nice work!!! 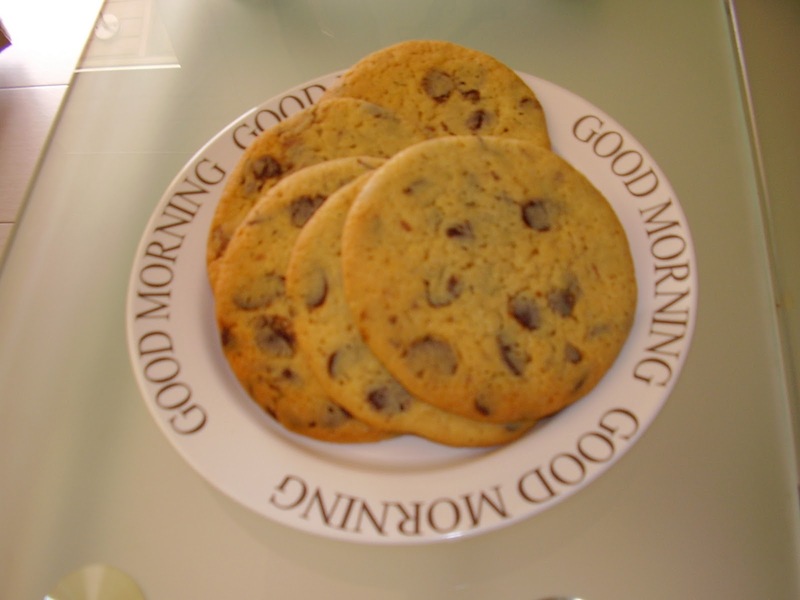 By the way this ccokies are yummy! Btw, just saw your message on foodbuzz.... Thanks for the compliment. Always love it.. What a great way to start your day !! Mmmmmm, cookies. LOVE me some cookies. They look great! New chocolate chips cookies are always welcome. the recipe I use is quite similar to yours. Yummy....chocolate chip cookies always hit the spot. Eftychia, these look like in a commercial or something :-) SO YUMMY...I migth try this!! Hope it is NICE in Cyprus! Warm and hot eh? Makes me want a cookie looks good.